We are the one-stop retailing information resource for massage therapists. We are passionate about how the right products support clients in their well-being and extending their massage experience to their home. We provide skills and information so therapists can appropriately and profitably incorporate retail sales into their practices. We do this through our resources, links, tips, articles, interviews, home study courses, workshops and consulting. We also host discussion forums for therapists to interact with each other about their experiences and questions on retailing. 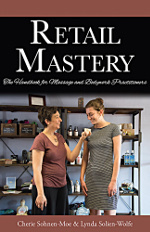 (Tucson, AZ) - Retail Mastery is the long-awaited book from two highly-respected educators in the massage and bodywork profession: Cherie Sohnen-Moe and Lynda Solien-Wolfe. They have been collaborating for several years on the topic of retailing. They have facilitated workshops, written articles and blogs, and host a website and a Facebook page on this topic. They are both passionate about the importance of retailing in enhancing clients’ wellness, as well as providing financial support for practitioners. Product sales are a great diversification method; the profits from the sales add an additional income stream that can defray overhead expenses. It is hazardous—physically, emotionally, and financially—to rely on your hands-on work as the sole source of your livelihood, particularly if your work requires intensity. Clients like to get products from you and appreciate the convenience of purchasing from you. They most likely get more education, service, and support with the products they buy from you than those they buy from a retail store or online. You save them time when they don’t have to make a special trip to buy an item, spend hours researching online, or wait days or weeks for it to be delivered. Most clients would rather purchase products directly from you (their trusted practitioner) than from an impersonal company. 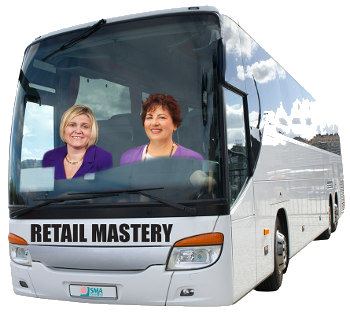 Retail Mastery is now available in Kindle format from Amazon.com. Amazon offers Kindle Reader apps for a number of devices; check your app store for availability. Copyright © 2010-2019 Sohnen-Moe Associates, Inc.